Heading out for a bite in the Big Apple? Then you might want to have LocalEats installed on your iPhone or iPod touch. 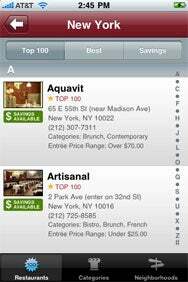 The $1 restaurant finder has teamed up with local restaurants to offer mobile coupons to the app’s users. Green Savings Available badges show which New York restaurants are offering deals through LocalEats. Here’s how it works: Participating restaurants now sport a green Savings Available badge in LocalEats’ New York listings. Tap on the restaurant to go to its entry, and you’ll see a Coupons tab at the bottom of the screen next to LocalEats’ customary Basics, Description, and Local Map buttons. 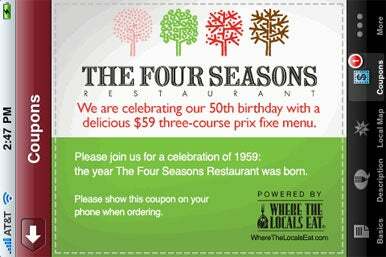 Tap the Coupon buttons, and you get a horizontally oriented coupon—no corkage fee if you bring a bottle of wine to Alto, for example, or a $59 three-course prix fixe menu at The Four Seasons. When it’s time to order, take out your iPhone, show the virtual coupon to your server, and reap the savings. LocalEats’ developer says that many New York restaurants have signed on, such as Daniel, Babbo, and Rosa Mexicano among others. You can get the complete list of participating eateries on the Web. As I noted in my review of LocalEats last year, the app isn’t like many of the other restaurant finders which depend upon user reviews. Instead, LocalEats draws upon data from the Where the Locals Eat Web site to provide very specific reviews of very specific eateries—the top 100 or so restaurants in each of the metropolitan areas it serves, in fact. It’s a terrific tool for travelers looking to broaden their culinary horizons beyond chain restaurants or even locals who want to discover well-regarded places in their own backyard. The coupon feature is limited to New York restaurants now. But the hope is that, with listings for 50 cities, LocalEats will eventually be able to roll out the service to diners across the country.